You can, I have learnt, scan your brain while you walk. It is a tidy development, since the brain talks to itself using that very power supply. Synapses are the tiny batsqueaks* of electricity which communicate across junctions between brain cells. Surely they can get friendly with a battery somehow. Lots and lots and lots of research has been done on humans asleep. Because that’s easy: they stay still. And so we know huge amounts about which parts of the brain are active as we slumber peacefully. But walking? Out in the open air, with the birds twittering and the leaves reflecting green at you from every direction and the leaves and mud squelching beneath your feet and the smell of earth surrounding you maternally? It’s called an ambulatory EEG. The electrodes are fixed to your head, usually using a cap, and then to a belt which you wear for days, even weeks. And the little box on your belt records all the activity as you go along. The University of Oldenberg, Germany, has been trialling just such a cap on its university students. They want to make something which is cheap enough to use for experiments. In trials, students have been pottering about the campus in strange headgear, recording their brain’s activity. And in November 2012, the university concluded it had found a way of making a lot of these caps without breaking the bank. But research on moving people is hard. Because the very act of moving makes it difficult to pick up the usual signals – the technical term is that they are ‘too noise prone’, or too open to interference. Now the University of Michigan has solved the problem by using only certain frequencies to cut out noise. And so the stage is set for a little experiment I propose. A little while ago,I wrote about how vital great writing,- truly momentous stuff like Shakespeare and Wordsworth – is to our souls. Liverpool University’s Magnetic Resonance Centre scanned people’s brains as they read great writing, and concluded that it sets us thinking in a whole new way. It encourages us to reflect. Reflection. Applying the lessons of humankind to our own lives. The search for learning and more: for true wisdom. And this morning, very early, I woke in my Saturday morning frame of mind listening to a radio programme – Ramblings – which followed a set of people on a very special walk. It was a walking book club. 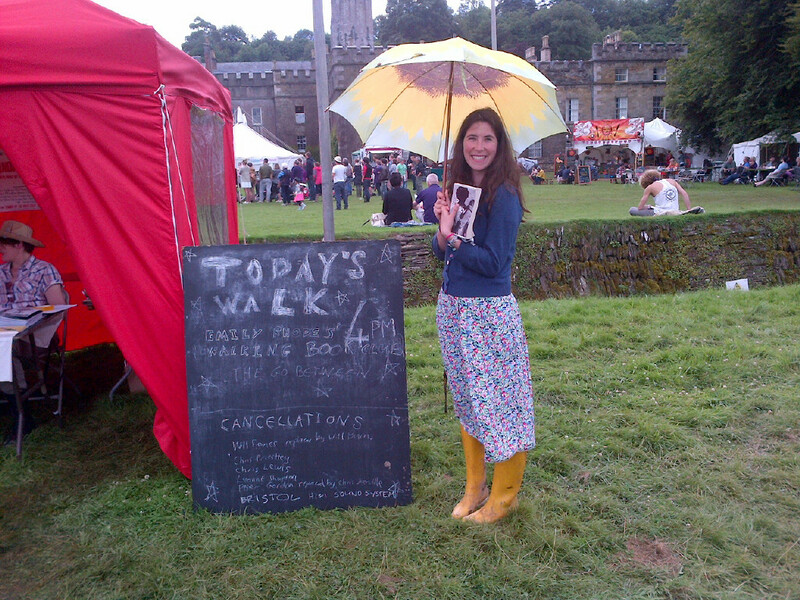 Members read their books and then turn up and follow a lady called Emily Rhodes, who wears bright yellow wellies, on a fabulous walk: and Emily, a passionate lover of books herself, -read her inspirational blog here – helps orchestrate a discussion on the book as they walk. Not before, not after, but during. And so no-one’s competing over the best house in which to meet, or the nicest cakes to accompany the discussion. No-one’s dominating the discussion, because people walk and talk in clutches. No-one’s feeling awkward about what to talk about while meeting new people, because, well, you talk about the book, you see. And by all accounts, the people who go on this walk count the days and hours until the next one. There is a passion in the air as the reporter talks to the ramblers, and the discussion – the incredible reflection which is going on – why, it’s something akin to that wisdom I was rambling on about. Perhaps the Universities of Liverpool, Michigan and Oldenberg, and Emily of the yellow wellies might hook up. Just perhaps, we might see what the brain does when people search, in a frank and unaffected way, during a lovely rambling English walk, for reflection. And, ultimately, wisdom. And then, might they share the secret with the rest of us? *Thanks Lame, I had forgotten all about batsqueaks…. Posted in WhimsyTagged books, Emily Rhodes, Radio 4, Ramblings, Walking Book ClubBookmark the permalink. “Les marches” are unbelievably popular here. When I first arrived here, I noticed all these little signs about dates and times of “marches”, which I took to mean markets. (there was no accent on the e) and even “marches nocturnes”. I would believe I was a fount of information and recommend friends to go these markets which were, of course, group country walks. I’m not keen on group activity, but I find that taking walks gets my imagination fired up. As a walker and a reader I like this idea a lot. The only thing I find hard to imagine is how everyone hears what everyone else is saying. Or do pairs or threes of people walk and talk about the book together, and then, as always happens in rambles, you find yourself walking alongside someone else, and hear what they have to say? IsobelandCat – you’re right, we start off together and then split into twos and threes to discuss an aspect of the book. Then we regroup at the top of a hill or in a shady spot, after 15mins or so to catch up, perhaps listen to an extract, before setting off again in different groups to chat about the next topic. And so on… Perhaps it sounds complicated, but it actually feels very easy and fluid! Emily! Thank you so much for popping over! It sounds very practical to me. And the people on your walks seem to agree. Walking helps energize my brain, too, so I love the idea of a walking book club. But as IsobelandCat says, how would everybody hear what was being said? Hi Jadi! Thanks for coming along to comment today! Ah, yes, Plato’s Republic, and Marcus Aurelius. A wonderful moment in a bleak old vision. I love Bradbury. I’m going to chip in all negative and nasty, here. Idle chit-chat does not detract from the enjoyment of sights, sounds and smells on a walk. A focus on a topic, however, would. I still prefer a book club environment for walking that kind of talk! Ah, but you have that femmy-ten ability to multi-task. Not so much taste as makeup – not in the lipstick sense. While riding or walking, I absorb. While writing, I reflect. Viva la difference! What a great idea. Exercising the brain and body together. I like it. I’d love to go along one day, Tilly! Great idea, except I often have difficulty in breathing whilst I walk much less thinking and talking. Perhaps more exercise is required in preparation – or less arduous walks. Quite, Darrell. One step at a time, so to speak 😀 Can’t discuss the niceties of Tolstoy if you’re wheezing so hard you can’t say anything. Perhaps a poetry stroll is more your thing? Very interesting stuff, although I would prefer a nice easy chair and a glass of red wine to properly discuss a book or most any topic. It comes down to the fact that we are all different, doesn’t it, Lou, with our own ways of thinking and being most creative. Books and wine for you; books and walking for me. Some of my best ideas, or the clarification of concepts come when am walking about. It is great for the body and the mind. I couldn’t agree more, Rafael. And all the secondary evidence about exercise and the brain points to it being a wonderful way to up our game. Is it eccentric of me to want to see how our brains change when we walk and talk about books? Perhaps. But I’d wager our brains light up like Blackpool Illuminations. What a great idea! I am most creative and eloquent while walking. Of course, I forget all my genius by the time I get back home…must work on that. Ha! You’re like me. I have to note stuff using my iPhone. One thing that often happens is that my unconscious is relaxed enough to proffer me answers to problems during a walk. The plot of my Christmas story this year was planned out as I tramped the forest. Brilliant post Kate and right up my alley with your quest for social research. I once say a motivational speaker, Kare Anderson (not the aerobics queen) who declared that walking with a work colleague while discussing an issue or problem would yield a higher result due to the kinesis. I believe it. I can accomplish a great deal and get “unstuck” by walking. How can we apply this as parents? My solution is the dog, Tammy 😀 I say, look, I’m sorry kids, but the dog must be walked. I say it each morning, and then I say it if someone is looking glum, and in the Summer months I say it in the evening. The kids see a lot of trees: but I’ll wager they begin to reflect on their lives at times like this. We talk about everything: books, life, school, the forest, you name it. And they are always happier when they return than when they started out. And the one to thank is the smelliest member of the household by far. Good books, exercise and fresh air sounds like a great combination to me! When out walking I always like to have a book with me. I never know when I will find a nice spot where I can sit down and have a good read. I usually take a paperback that can fit in a pocket. When I walk, it’s either to get somewhere, and the goal is uppermost, or it’s to absorb the outdoors and leave behind the sights, sounds, smells, and thoughts (and books) of the indoors. When my senses are being flooded with sunshine, blue sky, fresh breezes, distant peaks, passersby, birds, the dog at my side, etc., there’s little room for anything else. I would love to walk and talk about a good book. I did, once, foolishly, try reading a book whilst walking down stairs. A broken foot set me back for awhile after that, as I went tumbling down the stairs. I did finish the book, however. Sigh. Every cloud has a silver lining, Penny 🙂 Hope you enjoyed Louisa May’s birthday. Love this post, Kate. BFF and I have some creative conversations while ambling about . . . it does seem to get us in touch with a different center of the brain. Quite. And we are surrounded by circumstantial evidence of how walking improves our mental faculties. Wouldn’t it be wonderful to see precisely what happens when we combine thinking and exercise? Since I do so much of my writing while walking, I can only imagine that discussing stories while walking would be added creative stimulation. What a delightful way to share a book you love. No pressure. No cleaning the house. No cooking or buying drinks. Just walk and talk. I gave the BBC’s Ramblings a listen. Very enjoyable. It was, wasn’t it, Judy? I shall be listening avidly to the next one! I know that pacing and taking walks helps me write. As for a walking book club, that sounds quite, pardon the pun, novel. As long as all the participants remain focused and no one is too distracted by say, that cat over there that looks stuck in a tree, it sounds great and I will not voice a batqueak of objection. I believe Hampstead Heath is one of the main venues, Lame. Must check out the cat-to-walker ratio, and more importantly, the preponderaces of bats capable of emitting a serviceable squeak. I know how rich my own dialogue can be on a walk as I sort and filter and create and solve. There’s something about the exercise along with fresh air that does open us up. I would love such a book club! I’m eager to check out Emily’s blog. She just looks like someone who invites good company and conversation! I totally agree, Debra. Someone who loves books for their own sake, and devises new ways for us all to share them: what a gem. Smidge, so glad you are going to take it further. It sounds such an inviting way to think about books. I shall be heading up to Hampstead to try out a book walk in the future! My brain definitely works overtime on my many walks.. Strip it all away, strip it all away. Read things you simply enjoy to read (like your blog). Write for the sheer joy of writing, even if 5 people might find their own enjoyment in it. This is what I had to come to understand for myself. There’s nothing to prove that really matters all that much. I think I’m even going to find a creative writing class to sign up for, because that sounds like fun, too. Write for the sheer joy of writing. You have it right there, Brett 🙂 Your words have come on a day they were particularly needed, so I thank you. All the best with the writing class. Each of us is unique and no-one can write like us. Who knows when that will come in handy?